Alovsat Garaja Aliyev was born 1956. In 1977, he graduated from “Applied mathematics” faculty of Azerbaijan State University and was accepted for employment at the Institute of Cybernetics of Azerbaijan Academy of Sciences. 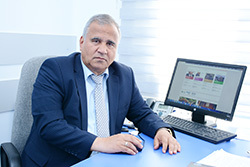 During following years, he worked in ACS Department of Azerbaijan Academy of Sciences as a programmer, engineer, leading engineer, from 1988 – as a group leader, and from 1989 – chief of sector, from 1990 – chief of laboratory, from 2002 – head of department. In 1982 he entered graduate school under the Institute of Cybernetics of Azerbaijan Academy of Sciences, where he defended a thesis in 1986. He is candidate of economical sciences on specialty of “Application of computing machinery and mathematical methods in economical processes, planning and management of national economy and its branches” (08.00.13) and docent on specialty of “Management and processing of information and system analysis” – 05.13.06. During 1977-1990 years, he was the head executive and leader of several important works in the field of designing and creation of “-Azerbaijan” system, as well as in the field of development of subsystems of relevant field of given system. 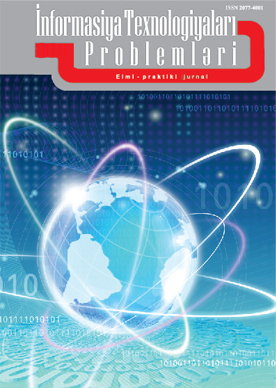 In 1991-2000 y. he addressed and conducted scientific-research work in the field of creation of multi-purpose information systems, economical-mathematical problems of information-communication spheres, macroeconomics processes, as well as distribution and formation of fiscal resources, issues of enlargement of productivity with application of newest information technologies in several spheres of economics and education, in analysis of condition of information-communication market and determination of its development perspectives etc. During following years, Alovsat Aliyev continues to conduct scientific-research works and deals with issues such as characteristics of ICT application in economical processes and management authorities, information problems in social-economical systems, scientific-theoretical basics of formation of information society, determination of demonstrative systems in ICT field, research of reasons of establishment of digital differences in the society, study economical basics, problems of informatization of humanitarian fields, humanitarian aspects of ICT etc. He actively participates in development of Government Plan “E-Azerbaijan” and demonstrative systems in IS and ICT, also in composition of several normative-legal documents. In 1986-1994 years, he was head of teachers and Assistant Professor at ASOA (Azerbaijan State Oil Academy), in 1992-1994 years he was Assistant Professor at MPI (Mingechevir Polytechnic Institute), in 1993-1996 he was a Assistant Professor at Azerbaijan Social-Political University, during 1996-2000 years he was the leader and Assistant Professor of Economics education center, and as of 2003 he is the curator in Training Innovation Center of ANAS Institute of Information Technology. He participated in a number of projects of AMF, RİTN, Ministry of Education in 2006-2015. He conducts appropriate coordinating work with SOCAR, as well as, some socio-economic enterprises of the republic, as well as some scientific institutions of Iran, Turkey, Russia, Belarus, Uzbekistan and Georgia. Under his leadership, Ph.D students and candidates for a degree work on dissertation topics in the relevant field. As the chairman of the Azerbaijani Information and Society Public Union and the head of the educational center under him, he promotes the formation of civil society and manages the implementation of a number of social projects. He is the author of 143 articles, including 30 of them were published abroad. He is the author of 5 books. 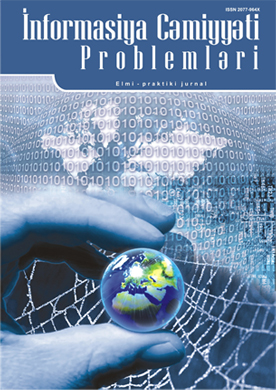 His articles published in scientific magazines and newspapers covers the actual problems of ICT and IS. He has been working as a department head at the Institute since 2002. He lectures on actual problems of ICT, IS and IT innovation economics at the Institute's Training Innovation Center. In 2015, he was awarded with the Honorary Decree of the Department of Physics, Mathematics and Technical Sciences of ANAS for his long-term scientific and scientific-organizational activity.